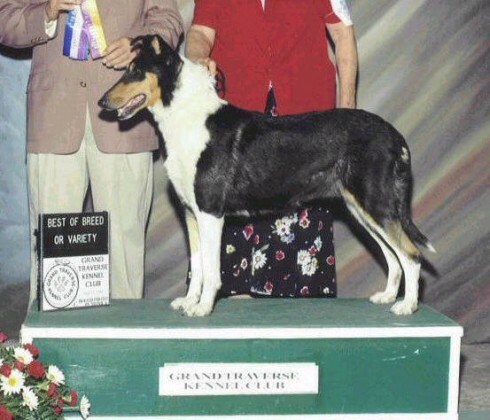 Collies are smart dogs with natural herding and protecting abilities. 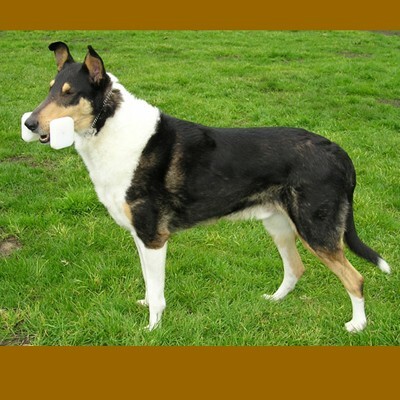 Like all working dogs, Collies need organized activities to thrive. Trained with a gentle, loving hand, they will learn quickly and happily. They are active, proud, and cautious. 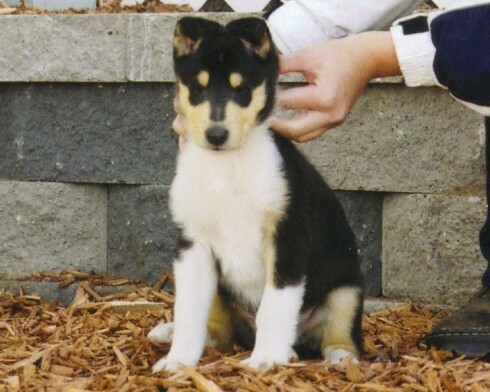 The Collie will be content in the country or city, as long as he has family companionship. 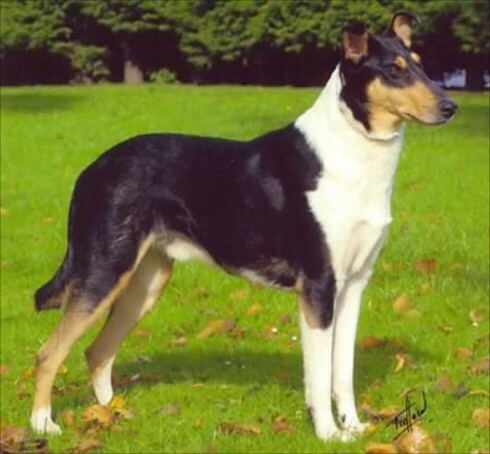 The collie comes in two varieties, the longhaired Rough and the shorthaired Smooth. 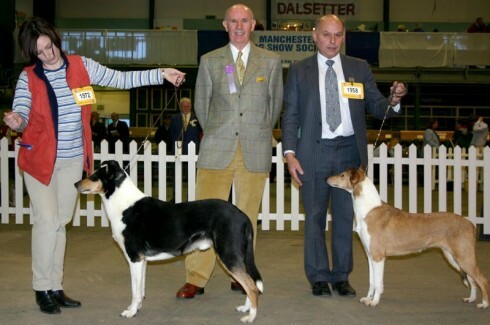 So you want to own a Collie? 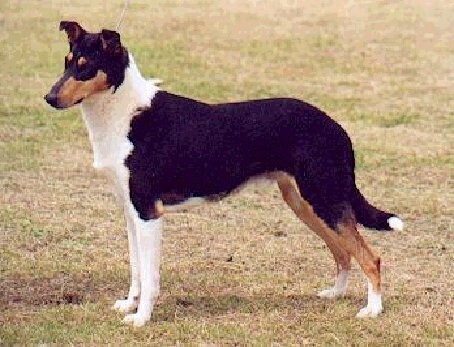 The Collie is an alert watchdog, quick to sound alarm and very protective of his family, although he is not an aggressive dog. Both rough and smooth coats require thorough weekly brushings to keep the coat clean and free of mats. 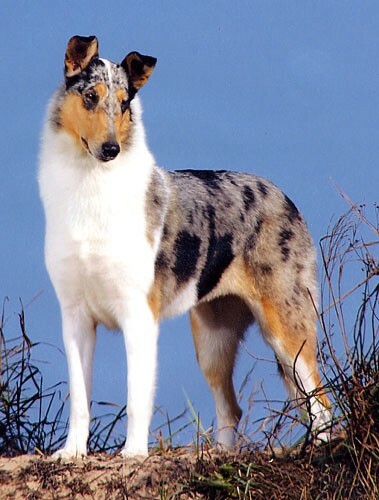 Renowned for his loyalty and his reliability, the Collie makes a great companion and friend. Appears as gifted with intelligence, alertness and activity. Stands with dignity governed by perfect anatomical formation, with no part out of proportion, giving appearance of working capability. Physical structure on lines of strength and activity, free from cloddiness and with no trace of coarseness. Expression, most important. In considering relative values, it is obtained by perfect balance and combination of skull and foreface, size and shape, colour and placement of eye, correct position and carriage of ears. Gay and friendly, never nervous nor aggressive. Head properties of great importance, must be considered in proportion to size of dog. Viewed from front or side, head resembles a well-blunted, clean wedge, being smooth in outline. Skull flat. 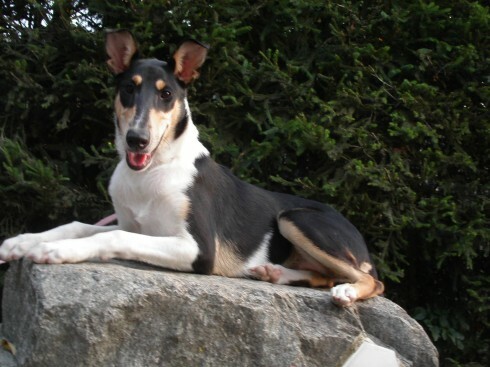 Sides taper gradually and smoothly from ears to end of black nose, without prominent cheek bones or pinched muzzle. Viewed in profile, top of skull and top of muzzle lie in two parallel straight lines of equal length divided by a slight, but perceptible stop or break. A mid-point between inside corner of eyes (which is centre of a correctly-placed stop) is centre of balance in length of head. End of smooth, well rounded muzzle blunt, never square. Under-jaw strong, clean-cut. Depth of skull from brow to underpart of jaw never excessive (deep through). Nose always black. Very important feature, giving sweet expression. Medium size (never very small), set somewhat obliquely, of almond-shape and dark brown colour, except in case of blue merles when eyes are frequently (one or both, or part of one or both) blue or blue-flecked. Expression full of intelligence, with quick, alert look when listening. Moderately large, wider at base, and placed not too close together nor too much on side of head. When in repose carried thrown back, but on alert brought forward and carried semi-erect, that is, with approximately two-thirds of ear standing erect, top third tipping forward naturally, below horizontal. Teeth of good size, jaws strong with a perfect, regular and complete scissor bite, i.e. upper teeth closely overlapping lower teeth and set square to the jaws. Muscular, powerful, of fair length; well arched. Shoulders sloping and well angulated. 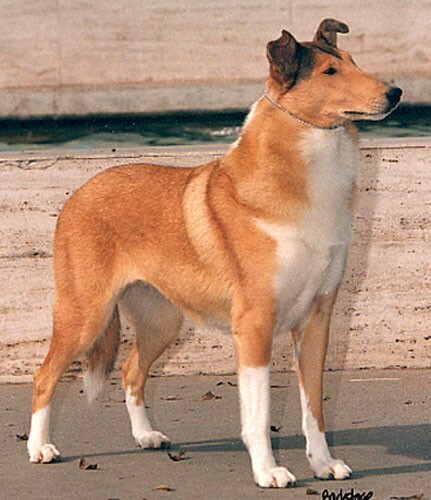 Forelegs straight and muscular, neither in nor out at elbows, with a moderate amount of bone. Forearm somewhat fleshy, pasterns showing flexibility without weakness. Slightly long compared with height, back level and firm with slight rise over loins; ribs well sprung; chest deep and fairly broad behind shoulders. Hindlegs muscular at thighs, clean and sinewy below, with well bent stifles. Hocks well let down and powerful. Oval soles well padded. Toes arched and close together. Hindfeet slightly less arched. Long with bone reaching at least to hock joint. To be carried low when quiet but with a slight upward swirl at tip. May be carried gaily when excited, but never over back. 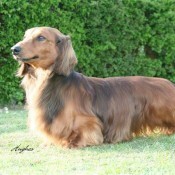 Distinctly characteristic of this breed. A sound dog is never out at elbow, yet moves with front feet comparatively close together. Plaiting crossing or rolling are highly undesirable. Hindlegs, from hock joint to ground, when viewed from rear, parallel. Hindlegs powerful and full of drive. Viewed from side, action is smooth. A reasonably long stride is desirable and should be light and appear quite effortless. Short, flat, topcoat of harsh texture, with very dense undercoat. Not trimmed or clipped. 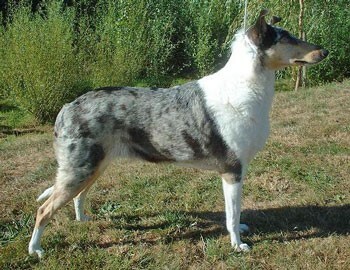 Three recognised colours: Sable and white, Tricolour and Blue Merle. Sable: any shade from light gold to rich mahogany or shaded sable. Light straw or cream colour is highly undesirable. 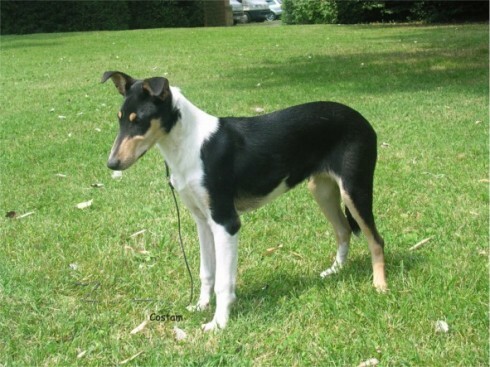 Tricolour: predominantly black with rich tan markings about the legs and head. A rusty tinge in top coat is highly undesirable. Blue Merle: predominantly clear, silvery blue, splashed and marbled with black. Rich tan markings preferred but absence should not be penalised. Large black markings, slate colour or rusty tinge top or undercoat are highly undesirable. 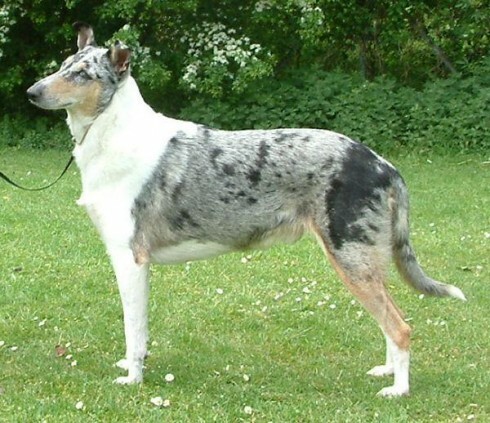 All may carry typical white collie markings to a greater or lesser degree. 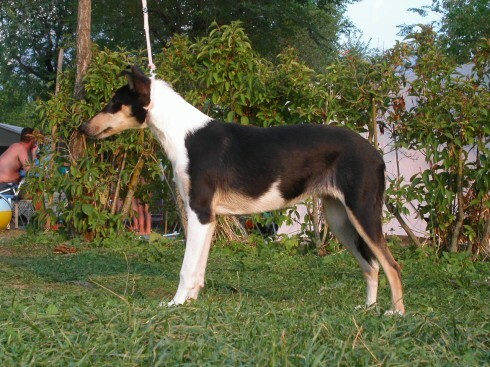 Following markings are favourable: white collar full or part; white front, legs and feet; white tail tip. A blaze may be carried on muzzle or skull, or both. All white or predominantly white is most undesirable.